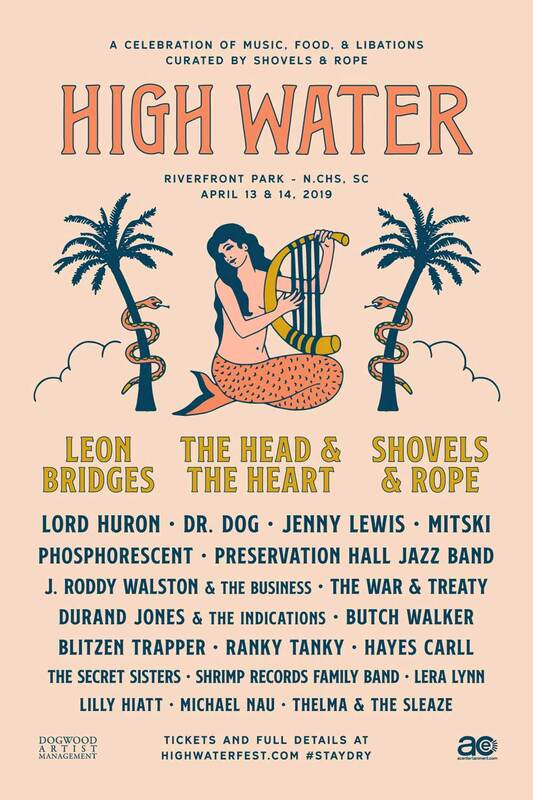 This weekend kicks off the annual High Water Festival which is being booked as “a celebration of music, food, and libations” and with the lineup and experiences listed on the website, it is surely set to be just that. Curated by Shovels & Rope, the American folk duo from Charleston, SC, the festival is a weekend long affair in the heart of their hometown. The lineup includes headliners like Leon Bridges, Lord Huron, The Head and the Heart, Phosphorescent and a dozen others stellar acts. While the words ‘Music Festival’ in 2019 conjures up images of flower crowns and EDM, HW Fest feels distinctly different. And by that, we mean distantly Southern. The city of Charleston, host of HWF, embodies all things hospitable and charming as evidenced by its world-class art, food and design scene. For these reasons, alongside its stunning natural landscape, it feels ripe for a music festival like High Water Fest which is sure to stand out amongst the crowded schedule of Spring festivals. While Charleston is no stranger to hosting arbiters of taste, there has not been a celebration comparable to High Water Fest in recent memory. While High Water Festival is in its third inception, this year’s unparalleled lineup of musicians is paired with a programming of southern cuisine related events giving attendees a true taste and feel of the Lowcountry. In addition to the stellar lineup of funk, indie, jazz & soul musicians there will be a series of events throughout the weekend dedicated to celebrating local cuisine. With event names like “Pass the Peas”, “Low Tide Social” and “Oyster Education” you are sure to get your fill of both the heritage and good ole fashioned cookin’ of this unique part of the country. Tickets to each are sold separately outside of the weekend pass so take your pick or join us for all! Food and drinks will also be available on the festival grounds from various local vendors. The music kicks off on Saturday, April 13th and jams on through the evening of Sunday, April 14th at Riverfront Park in North Charleston on the former Charleston Naval Base. Located just a few miles north of downtown Charleston and just south of the Charleston International airport, the park is easy to get to via I-526 and I-26. Parking is limited and costs $10/day (included with VIP tickets) so the festival recommends carpooling whenever possible. High Water festival also provides complimentary bike valet for those cycling to and from the park. We’re excited to attend this year’s High Water Festival and will be reporting back with a full recap of this weekend’s festivities. We hope to see you there!